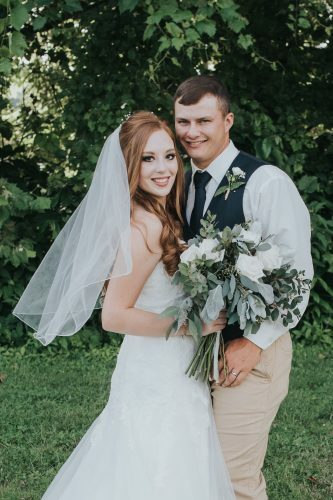 Natalie Yvette Mehl and Michael Joseph Shoenfelt were united in marriage in a double ring ceremony on July 4, 2015 at 3:30 p.m. at Rockland United Methodist Church in Belpre. Dr. Rev. Dennis Mohler officiated the ceremony. 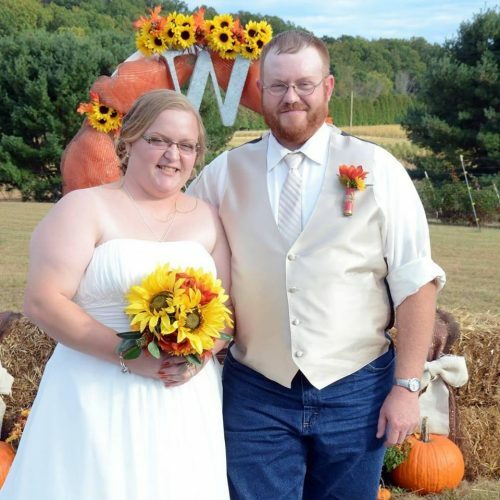 The bride is the daughter of Christopher and Debora Mehl of Belpre. She is the granddaughter of Doris and the late Charles Crum of Belpre and Francine Mehl of Belpre. 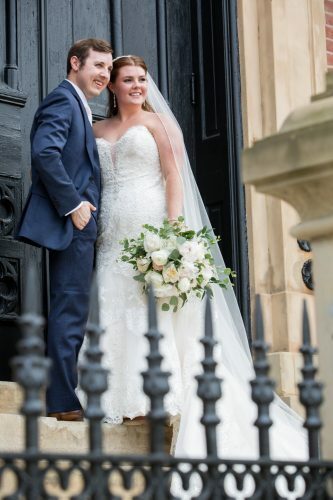 The bridegroom is the son of Robert Shoenfelt of Sidney, Ohio, and Dr. Jennifer Shoenfelt of Cincinnati. He is the grandson of Charles and Virginia DiSalvo of Pittsburgh, and Robert and Eleanor Shoenfelt of Lakeland, Fla. Maid of honor was Jillian Lebonitte, college friend of the bride of Falls Church, Va. Bridesmaids were Jordan Jewett of Marietta, Sarah Kindzerske of Washington, D.C., Jonae Powers, of Atlanta, Ga., Holly Coats of Columbus, all childhood friends of the bride, Christine Meadows and Meghan Innes, both of Columbus and college friends of the bride, Heather Mehl of Belpre, sister-in-law of the bride, and Stephanie Shoenfelt of Minneapolis, Minn., sister of the bridegroom. The bridesmaids all wore short, dark purple dresses and carried smaller versions of the bride’s bouquet. Best men were Christopher Buehler and Anthony Zimmerman, both of Columbus and both college friends of the bridegroom. Groomsmen were Joseph Staudt of Baltimore, Md., Peter Berlekamp and Marc Taylor, both of Columbus, all childhood friends of the bridegroom, Brandon Smith of Worthington, Ohio, Paul Brandstetter of Bellevue, Ky., Rob Bonacci of Philadelphia, Pa., all college friends of the bridegroom and Nicolas Mehl, of Belpre, brother of the bride. The groomsmen wore gray suits with purple gingham ties and pocket squares. Readings were given at the ceremony by Ambre Hurak, college friend of the bride and Dr. Dominic Bagnoli, godfather of the bridegroom. Brad and Christina Zimmerman, childhood friends of the bridegroom, sang before and during the ceremony. The bride wore an ivory, crinkle chiffon gown with asymmetrical draping and a beaded belt. She carried a mixture of purple and white flowers. The bride was escorted down the aisle by her father and given in marriage by her parents. A reception was held at the Historic Lafayette hotel after the wedding. 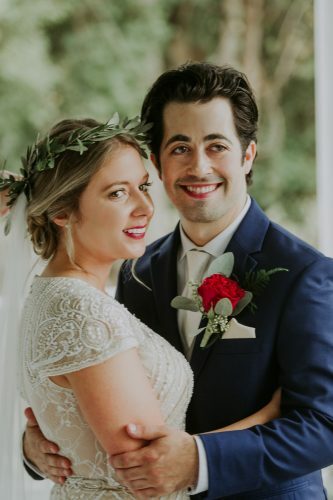 The bride is a 2008 graduate of The Ohio State University with a degree in strategic communications and is employed by J.P.Morgan as a campus recruiter. 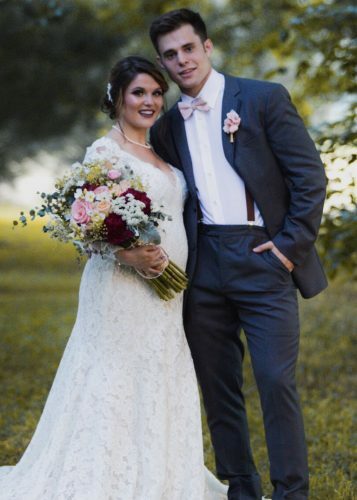 The bridegroom is a 2010 graduate of The Ohio State University with a degree in history and a 2013 graduate of The Ohio State University Moritz College of Law. He is employed as a labor and employment attorney at Vorys, Sater, Seymour and Pease. 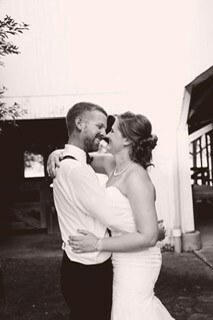 After a honeymoon in Aruba the bride and groom will reside in Columbus.